WILDER, Vt. — Betty Brown died peacefully Saturday morning, Dec. 12, 2015, at Valley Terrace in Wilder. She was 92. Betty was born in Atalissa, Iowa, on June 18, 1923, to Charles and Nelle Metzinger Overman. She had two older sisters, Bonita and Janice, and an older brother, Robert. When Betty was 2 months old, the family moved to Detroit, and later, to Rosedale Gardens in Plymouth, Mich. Her family spent time during the summer at the nearby Bishop Lake, where she developed a lifelong love of the outdoors. Betty attended schools in Detroit and Plymouth, where she was an honors student, captain of the swim team and played the lead in the senior class play. As a member of Rosedale Gardens Presbyterian Church, she was a choir member and Sunday school teacher. She was accepted at the University of Michigan, Ann Arbor, but instead chose to work for Burroughs Adding Machine, and later, for Detroit Diesel in the payroll department. During this time, she became interested in flying, began taking lessons and, on April 24, 1943, soloed a 65-horsepower Taylorcraft. Shortly afterward, she and a friend bought a small plane together. 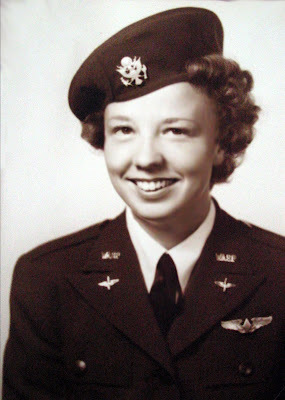 After seeing the July 19, 1943, issue of Life Magazine featuring a female Air Force pilot on the cover, Betty applied to the Women’s Airforce Service Pilots (WASP) program and was accepted. She reported to Avenger Field in Sweetwater, Texas, in February 1944. On Sept. 8, she received her wings and reported for duty at Aloe Field, where she towed targets for aerial gunnery practice, flying a 600-horsepower AT-6. The sisterhood of the WASP remained very important to Betty for the rest of her life. After the war, Betty moved to Florida, where she met her husband-to-be, Ron Brown. They were married in December 1948 and enjoyed more than 65 years together. They lived first in Denver, and later, in Chevy Chase, Md., raising a daughter, Kathy, and two sons, Rod and Tyler. During this time, Betty and Ron grew to be avid whitewater canoeists, spending vacations canoe-camping all along the eastern seaboard, but especially in the deep woods of northern Maine on the Saint John, Allagash and Penobscot Rivers. In the fall of 1970, Betty and Ron bought a small camp without electricity or running water on Gilman Pond in North New Portland, Maine. The following August, after the first expansion of the camp, Betty suggested they move there permanently with son Tyler. This became their home for the next 38 years, and they used it as a home base for exploring whitewater throughout the Maine wilderness, including the Allagash River, which Betty solo canoed. During these years, Betty was busy with the community, serving on the town planning board, as well as the school committee, and as chairman of the Maine State Critical Areas Advisory Board. When husband Ron retired in 1983, they bought a 1958 PA-18 Piper Cub together. Betty renewed her pilot’s license, and she and Ron flew all over the country, especially enjoying the fly-ins at Sun and Fun in Florida, and the EAA fly-in in Oshkosh, Wis. In 1977, President Jimmy Carter awarded the WASP full military status and, in 2010, Betty traveled to Washington, D.C., with about 175 surviving WASP — and her entire family — to accept the Congressional Gold Medal for their service during World War II. In recent years, Betty and Ron moved to an apartment in Skowhegan, Maine, and then to Lebanon, N.H., where they were closer to son Tyler. After Ron passed away in July 2014, Betty moved to Valley Terrace in Wilder, where she made many friends among residents and staff. Betty was a dynamic and independent woman who lived life to the fullest. She loved the outdoors and was never happier than when camping with her husband, Ron. She treasured close friends and her family above all else, and carried a smile with her at all times. Betty passed away after a battle with congestive heart failure but not before meeting her newest great-granddaughter as her family gathered around her. Daughter, Kathy Brown, Boonsboro, Md., survives her, as well as sons, Rod Brown, Silver Spring, Md., and Tyler Brown, East Thetford, Vt.; grandsons, Sean Walsh and Kevin Roy; and three amazing great-granddaughters, Mia and Zoe Walsh, and Emilia Roy. Plans are being made for a springtime service in Maine. In lieu of flowers, donations in Betty’s name may be made to Alice Peck Day Memorial Hospital, 10 Alice Peck Day Drive, Lebanon, NH, or to Texas Woman’s University, WASP Archive, P.O. Box 425528, Denton, TX 76204-5528. *quote and photo from Wings Across America's interview with BJ. Personal note: B.J. Brown was a delightful, optimistic, energetic, wonderful WASP. She welcomed us into her Sun City, Arizona home, and over the course of 3 hours, charmed us with her adventures. She shared her passionate love for the woods and rivers of Maine, and her deep love of her family. When asked what got her through the tough times in her life, Betty answered simply, "prayer...and time...and facing things squarely." Simple, to the point, that was B.J. We were honored to call her friend and so blessed to have known her. 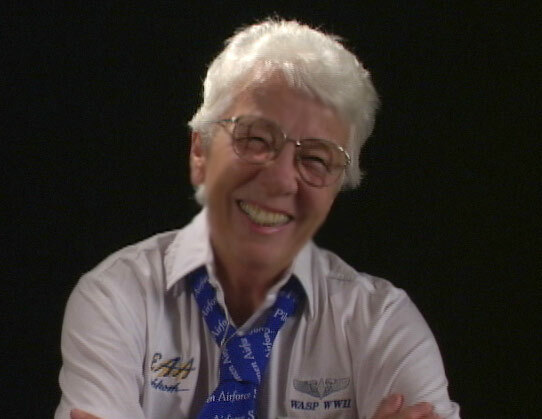 Our prayers for her family and all of those who were touched by this loving lady pilot.